Lock in a great price for Sheraton Vistana Villages Resort Near Universal – rated 8.8 by recent guests! We had a two bedroom room and it was a good size for our family. It was convenient having a washer/dryer and full kitchen. We had a great view of the main pool, basketball court, and gym. This was great because we could see our older kids from our porch. Beautiful grounds. Beds and pillows were very comfy. Kids loved getting smoothies at the Cabana by the pool. Good location to the parks and other activities. The overall beauty and amenities were wonderful. The room was fantastic. They did not have my room reserved properly upon check-in, but quickly resolved the issue. The variety of pools with hot tubs available was great. The market was convenient, if a touch pricey (as to be expected). All clean nice facilities, friendly people, pool towels easily available until the late evening, so we could enjoy a day at the park then relax at the pool and hot tub with dinner at the pool restaurant. Service at the pool restaurant was very friendly. Excllent place. Value for money. Family friendly. Pools. near to universal. Loved the daily cleaning service! The amenities were Awesome! The Main pool was Amazing! The kid activities were so much fun! The beds were very comfortable, the living room was comfy and cozy. The unit had a washer dryer and a nice kitchen. The pool and grounds were really beautiful! Excellent location and great facilities! My kids loved the pools especially! I like that the checkin was nice, smooth sailing, clean environment, they had grills to cook on and a fridge to store things. Best place I've stayed so far.Beds were so comfortable. Sheraton Vistana Villages Resort Near Universal This rating is a reflection of how the property compares to the industry standard when it comes to price, facilities and services available. It's based on a self-evaluation by the property. Use this rating to help choose your stay! One of our top picks in Orlando.This Orlando resort is a 15-minute drive from Walt Disney World and Universal Studios Theme Park. Features include an outdoor water park, theme park ticket services, and apartments with free Wi-Fi. The property is 3.9 mi from the Orange County Convention Center. 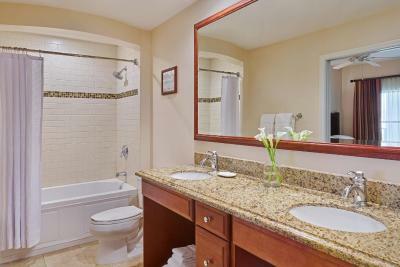 The spacious apartments at the Sheraton Vistana Village Resort include a full kitchen or kitchenette. A living room with a sofa bed and an in-villa laundromat are also provided. The fitness center provides free weights and cardio machines. Guests can relax on the terrace and have a drink at the poolside bar. Flagler Station Bar & Grill, on site, serves American dishes for breakfast, lunch, and dinner. Mallory Square Market has coffee and pastries. 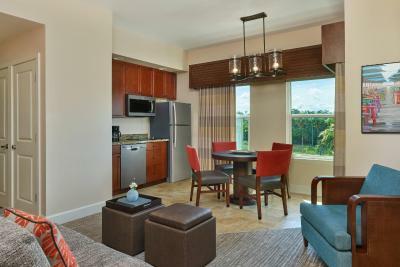 When would you like to stay at Sheraton Vistana Villages Resort Near Universal? This quadruple room has a dining area, stovetop and tumble dryer. This double room features a toaster, CD player and tumble dryer. This family room has a balcony, cable TV and dining area. House Rules Sheraton Vistana Villages Resort Near Universal takes special requests – add in the next step! Sheraton Vistana Villages Resort Near Universal accepts these cards and reserves the right to temporarily hold an amount prior to arrival. Guest must present the credit card used to pay for the reservation at time of check-in. Just two design flaws in the master bedroom: add a blackout curtain to the door leading to the porch (those mini blinds aren’t good at blocking sun); the door to the shower/toilet area is poorly located as it’s too big and is hard to actually get into the area and close the door (toilet and sink are in the way and you have to shuffle around as you’re trying to close the door). Having the door open out would fix this. Adding a ceiling fan in bedrooms would be nice too. Did not use facility much except for pool. Overall it seemed very clean, however, the rugs in the room need replacement or a good cleaning. Loved everything. I don’t have anything I didn’t like. The pool towels were not available at night, even though the pool was still open. We went to the pool at 8 and it closed at 11. Bought tickets for the Magic Kingdom online. Bought tickets for Universal Studios from the hotel, they didn't know that Universal was having an event the next day and would close at 6:00 p.m., nearly ruined our day. Buy your tickets online or at the park and make sure you check on the schedules yourself. They'll also try to sell you on attending a time-share presentation, it was professional and not too high pressure, but still a waste of time for us, though the discounts they offered in exchange were nice. The location, no problem if you have a car. Everything about this place is awesome! Love both the room and the facilities it provides. Definitely I will stay here again when I come back to Orlando. Furnishings- Little outdated kitchen and Bath cabinets food was Expensive . Did The time share presentation-not within the promised 90 minutes then they had an attitude when we said no to commiting. The housekeeping needs improvement.. one day we weren’t given any wash cloths, a couple of days the toilet paper wasn’t replenished. AC blew too hard and appartment struggled to keep the correct temperatures. It was either too cold or too hot. Everything was amazingly good. The quality and the cleanliness is top notch. Minor suggestions-supply powder creamer packets for coffee... And small bottles of mouth wash. Maybe u can ask Colgate to let u have them for free like a promotion. The only thing that was really annoying, when a/c went on/off it made a wizzing sound all nite long.